Insider Monkey has processed numerous 13F filings of hedge funds and famous investors to create an extensive database of hedge fund holdings. The 13F filings show the hedge funds and investors’ positions as of the end of the third quarter. You can find write-ups about an individual hedge fund’s trades on numerous financial news websites. However, in this article we will take a look at their collective moves and analyze what the smart money thinks of Sumitomo Mitsui Financial Group, Inc. (NYSE:SMFG) based on that data. Sumitomo Mitsui Financial Group, Inc. (NYSE:SMFG) witnessed an increase in hedge fund ownership during Q3, but overall sentiment remains muted, as just 1.4% of the hedge funds tracked in our database were SMFG shareholders on September 30. One of them is Fisher Investments, which has been long Sumitomo Mitsui Financial Group, Inc. (NYSE:SMFG) since the second quarter of 2017 and bought another 1.65 million shares of the Japanese banking firm in Q3. 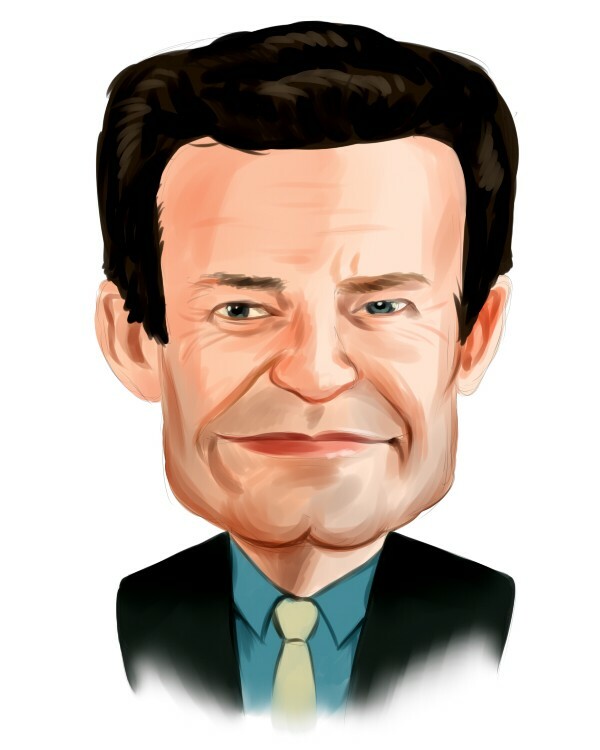 That resulted in it ranking 14th of our list of the 25 Dividend Stocks that Billionaire Ken Fisher is Bullish On. The stock’s dividend yield currently sits at a healthy 4.43%. According to most shareholders, hedge funds are seen as unimportant, old financial tools of yesteryear. While there are over 8000 funds in operation at present, We hone in on the aristocrats of this group, about 700 funds. These money managers control bulk of all hedge funds’ total capital, and by paying attention to their unrivaled equity investments, Insider Monkey has found a number of investment strategies that have historically defeated the S&P 500 index. Insider Monkey’s flagship hedge fund strategy surpassed the S&P 500 index by 6 percentage points annually since its inception in May 2014 through early November 2018. We were able to generate large returns even by identifying short candidates. Our portfolio of short stocks lost 26.1% since February 2017 even though the market was up nearly 19% during the same period. We just shared a list of 11 short targets in our latest quarterly update. How are hedge funds trading Sumitomo Mitsui Financial Group, Inc. (NYSE:SMFG)? At Q3’s end, a total of 10 of the hedge funds tracked by Insider Monkey were long this stock, a 25% increase from one quarter earlier. 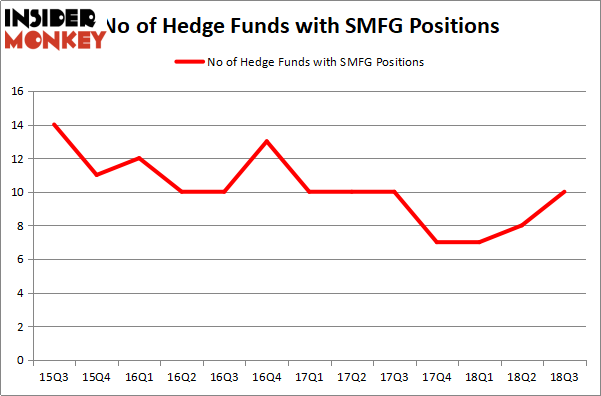 The graph below displays the number of hedge funds with bullish position in SMFG over the last 13 quarters. So, let’s see which hedge funds were among the top holders of the stock and which hedge funds were making big moves. Of the funds tracked by Insider Monkey, Fisher Asset Management, managed by Ken Fisher, holds the number one position in Sumitomo Mitsui Financial Group, Inc. (NYSE:SMFG). Fisher Asset Management has a $477.3 million position in the stock, comprising 0.6% of its 13F portfolio. Sitting at the No. 2 spot is D E Shaw, which holds a $9.2 million position. Some other peers that are bullish contain Ben Levine, Andrew Manuel and Stefan Renold’s LMR Partners, William B. Gray’s Orbis Investment Management and John Overdeck and David Siegel’s Two Sigma Advisors. As one would reasonably expect, key hedge funds were breaking ground themselves. LMR Partners assembled the largest position in Sumitomo Mitsui Financial Group, Inc. (NYSE:SMFG). LMR Partners had $6.4 million invested in the company at the end of the quarter. Peter Rathjens, Bruce Clarke and John Campbell’s Arrowstreet Capital also initiated a $0.2 million position during the quarter. The following funds were also among the new SMFG investors: Ken Griffin’s Citadel Investment Group and Michael Platt and William Reeves’ BlueCrest Capital Mgmt..
Let’s check out hedge fund activity in other stocks – not necessarily in the same industry as Sumitomo Mitsui Financial Group, Inc. (NYSE:SMFG) but similarly valued. These stocks are Enbridge Inc. (NYSE:ENB), Ecopetrol S.A. (NYSE:EC), Northrop Grumman Corporation (NYSE:NOC), and Simon Property Group, Inc. (NYSE:SPG). This group of stocks’ market values resemble SMFG’s market value. As you can see these stocks had an average of 23 hedge funds with bullish positions and the average amount invested in these stocks was $648 million. That figure was $501 million in SMFG’s case. Northrop Grumman Corporation (NYSE:NOC) is the most popular stock in this table. On the other hand Ecopetrol S.A. (NYSE:EC) is the least popular one with only 13 bullish hedge fund positions. Compared to these stocks Sumitomo Mitsui Financial Group, Inc. (NYSE:SMFG) is even less popular than EC. Considering that hedge funds aren’t fond of this stock in relation to other companies analyzed in this article, we wouldn’t recommend considering an investment in it at this time. Is Choice Hotels International, Inc. (NYSE:CHH) A Good Stock To Buy? Hedge Funds Are Betting On Etsy, Inc. (NASDAQ:ETSY) Is TripAdvisor, Inc. (NASDAQ:TRIP) A Good Stock To Buy? Some Hedge Funds Are Crazy About Tesla, Inc. (TSLA) Is Box, Inc. (NYSE:BOX) a Good Stock to Buy? Is Yelp Inc. (NYSE:YELP) Going to Burn These Hedge Funds?